AzhwAr’s sensory perceptions went ahead of him and engaged with emperumAn. They started instructing AzhwAr “AzhwIr! Do not let go of emperumAn!”. 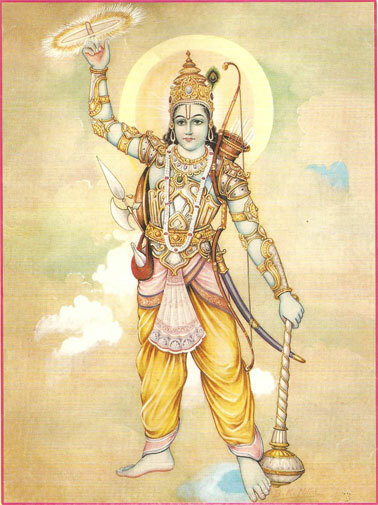 In the earlier pAsuram, AzhwAr stood in the position of guru (teacher) and instructed his sensory perceptions. In this pAsuram, his sensory perceptions instructed him on the same matter, in the position of guru. Thus the guru-Sishya (teacher-student) order has got reversed in this pAsuram. avan than paNbu Azhi thOL paravi Eththennum – will instruct to worship his divine shoulders which are like beautiful ocean. pUN Aram pUNdAn pugazh kEL ennum – will instruct to hear the praise of emperumAn who has donned the decorative pearl necklace. anbu AzhiyAnai aNugu ennum – mind is such that it is an embodiment of affection which is as deep as the ocean. Thus, instead of calling it as mind, AzhwAr is referring to it as anbu which means affection. Such a mind is instructing AzhwAr to approach and attain emperumAn. In the earlier pAsuram, AzhwAr instructed his heart [the terms heart and mind are interchangeably used in all these pAsurams] “adalAzhi koNdAn mAttu anbu vidal” (Oh dear heart! Do not let go of the affection towards emperumAn). Looking at AzhwAr, his heart tells him “do not worry about me. Please do not let go of emperumAn”. AzhiyAn – just as one is engrossed with the bracelets worn by princes on their shoulders and forearms, the heart is engrossed with the beauty of the emperumAn who is having the divine disc on his hand. nA avanthan paNbu Azhith thOL paravi Eththu ennum – my tongue will instruct me to worship, even if in an disorderly way, his simplicity and strong shoulders. AzhiththOL – For the word Azhi instead of the meaning “strong”, if one were to consider the meaning “ocean”, we can say that his divine shoulders are like the beautiful ocean. munbu Uzhi kANAnaik kAN ennum kaN – eyes will instruct me to worship emperumAn who has not seen the times of eons. My eyes do not know whether that is possible or not. munbu Uzhik kANAn – Are we not those who have committed faults? We do not have to fear as how we will attain emperumAn. AzhwAr says that emperumAn will forget the times when we carried out such offences. If he thinks of those times, wouldn’t he be reminded of our offences too? Hence, along with our faults, he forgets the times too, when we committed such faults. Didn’t nammAzhwAr mercifully say in his thiruvAimozhi 2-7-3 “mAdhavan enRadhE koNdu ennai ini ippAl pattadhu yAdhavangaLum sErkodEn enRu” (Since I merely said mAdhava, emperumAn vowed that he will not allow any difficulties to come to me for all times hereafter)! We would know whether he is looking at us with anger or with affection in his eyes when he sees us. Hence eyes will say “look at him”. pUN Aram – decorative ornaments for the divine physical form which, by itself, is like an ornament. Didn’t hanuman say in SrI rAmAyaNam kishkinthA kANdam “sarvabhUshaNa bhUshArhA:” (divine shoulders which will decorate all the ornaments)! pUNdAn – beauty which is to be decorated. pugazh – isn’t praising emperumAn an ornament for AthmA! We shall consider the 73rd pAsuram next. This entry was posted in iyaRpA, mudhal thiruvandhAdhi on August 21, 2017 by T N Krishnan.